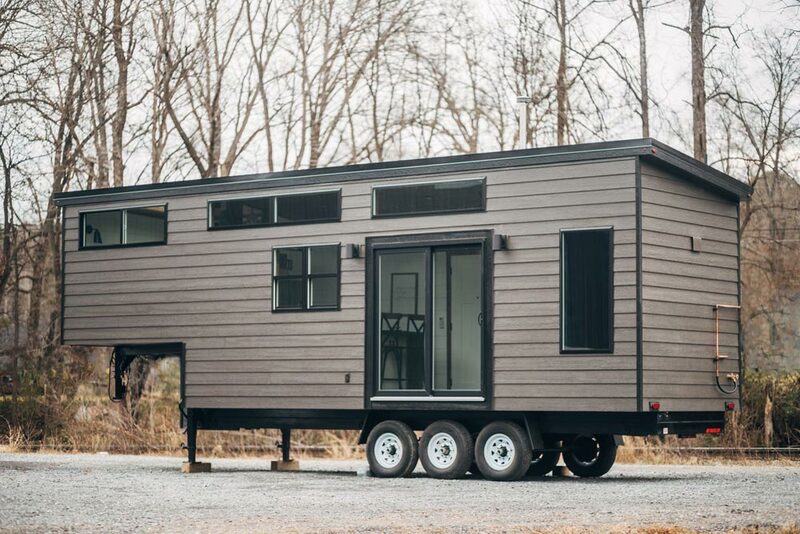 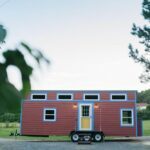 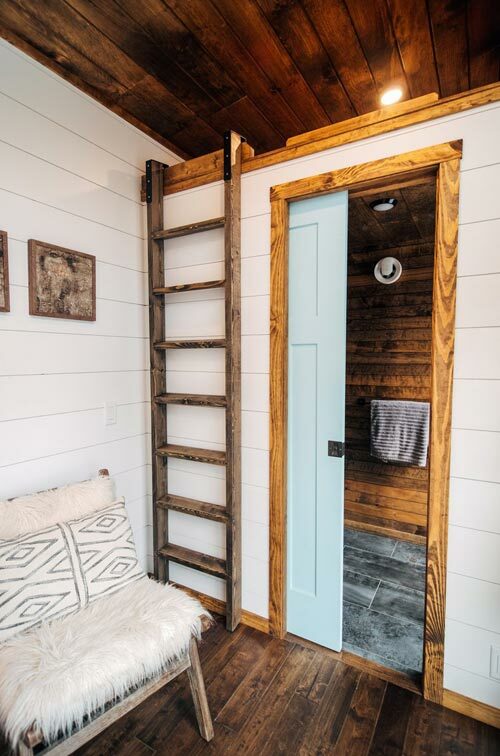 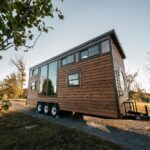 From Chattanooga, TN-based Wind River Tiny Homes is the Lupine, a 32-foot gooseneck tiny house on wheels. 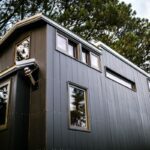 The home features a window wall to take advantage of the owners’ view overlooking a cliff in the Blue Ridge Mountains. 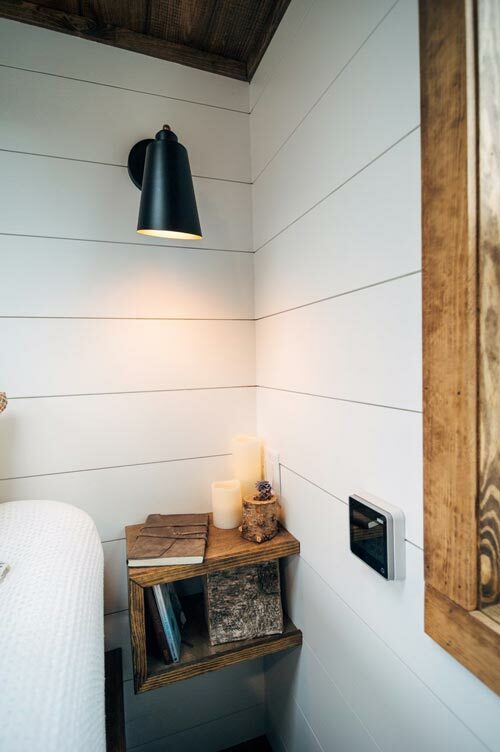 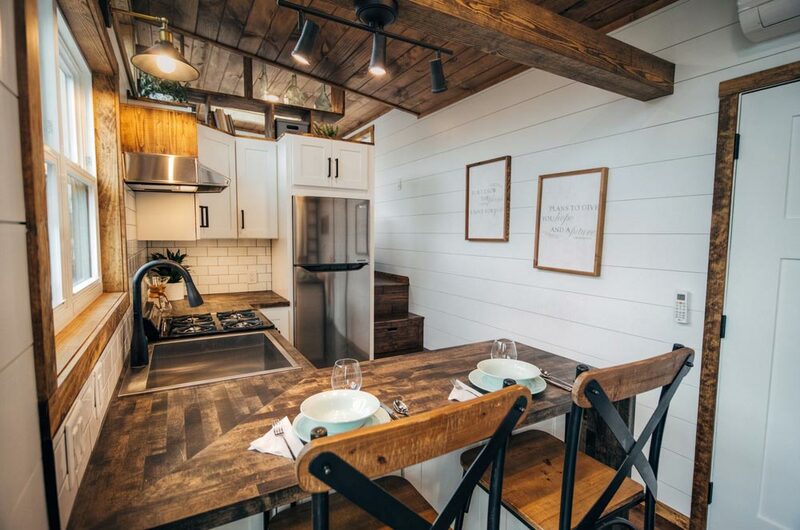 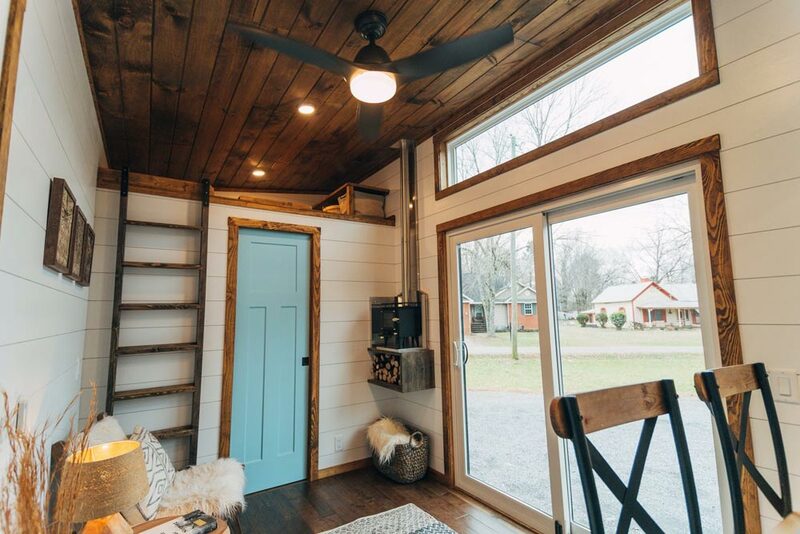 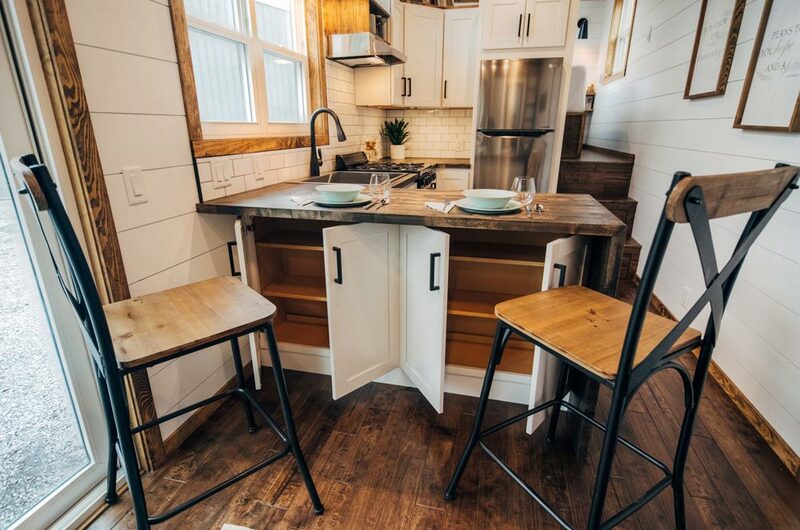 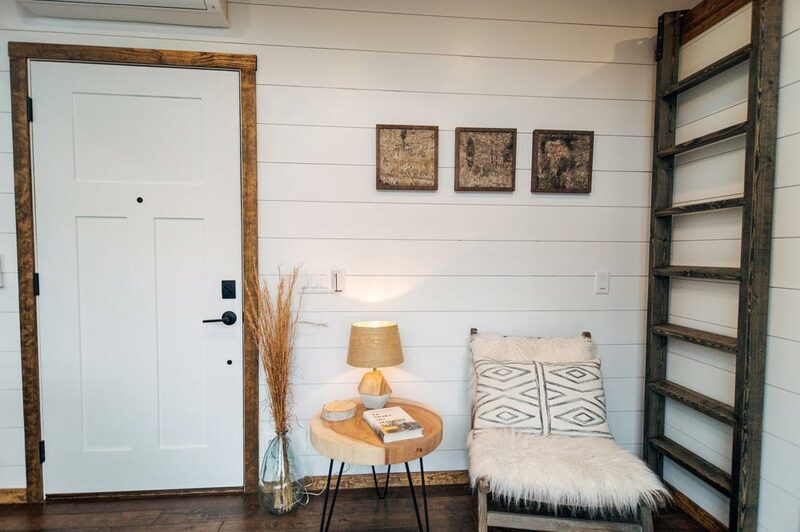 The triple axle gooseneck tiny home has a 36″ main entrance across from a large sliding glass door. 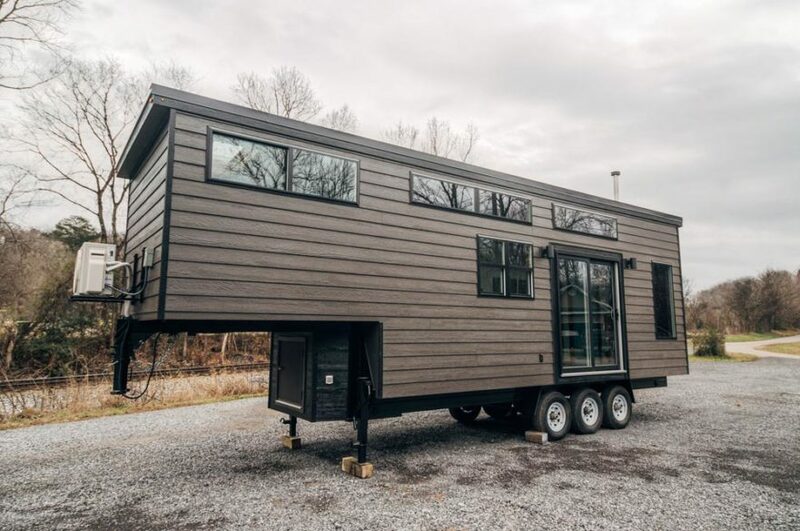 The main entry side only has one window since all of the other windows are on the opposite side to take advantage of the view. 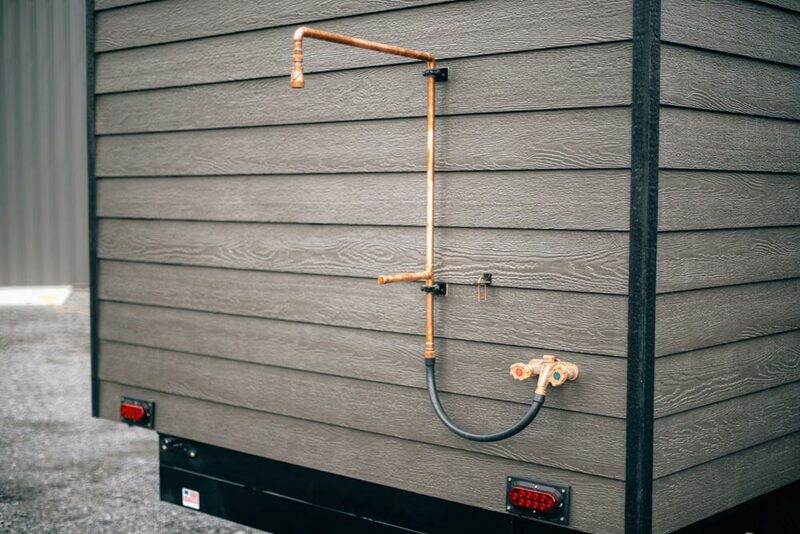 At the rear of the home is a copper outdoor shower. 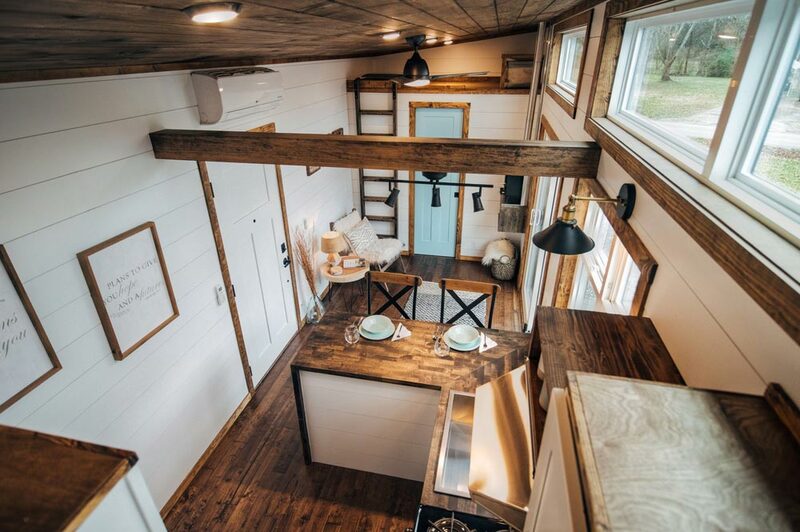 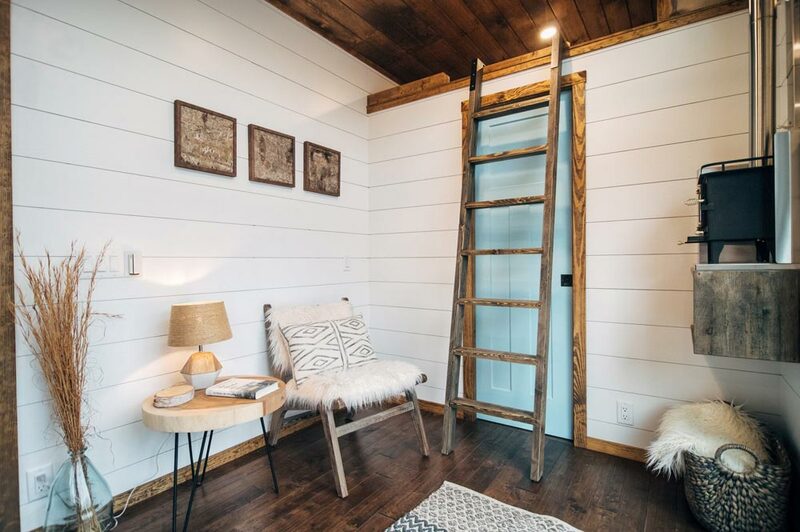 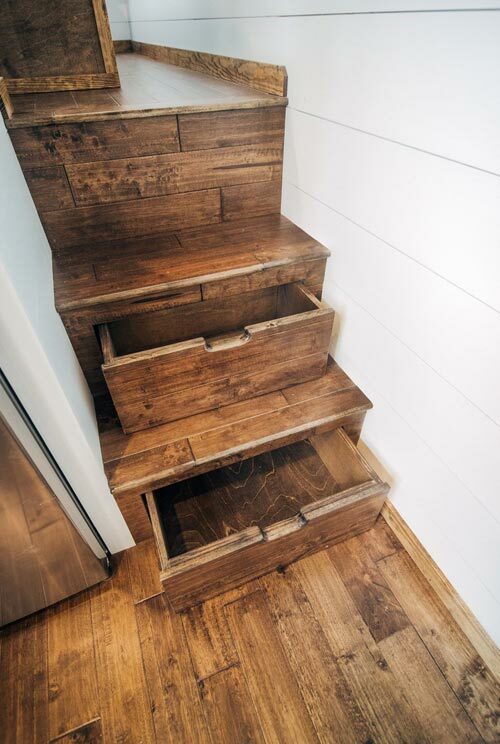 The interior finishes include 3/4″ hardwood floors, an open beam, and a stained wood ceiling to match the floors. 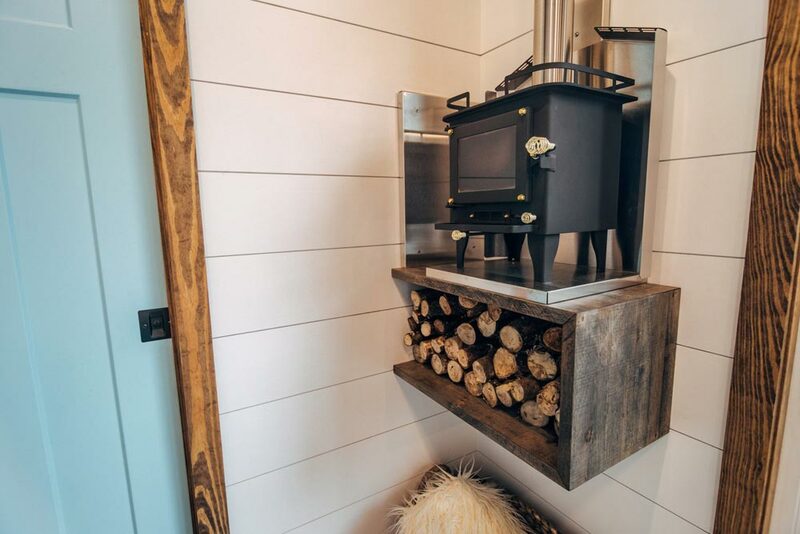 In the living room is a Grizzly Cubic Mini wood stove and firewood storage shelf. 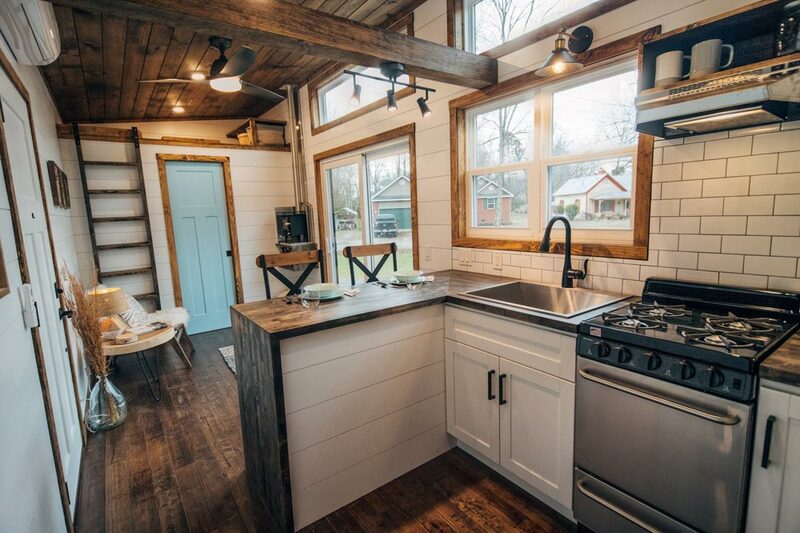 The kitchen has a white subway tile backsplash and a wood counter with breakfast bar. 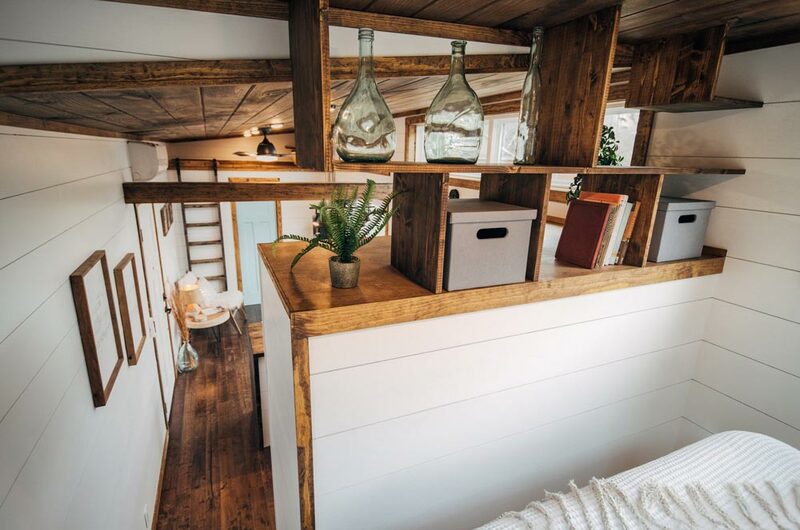 Under the bar are two cabinets. 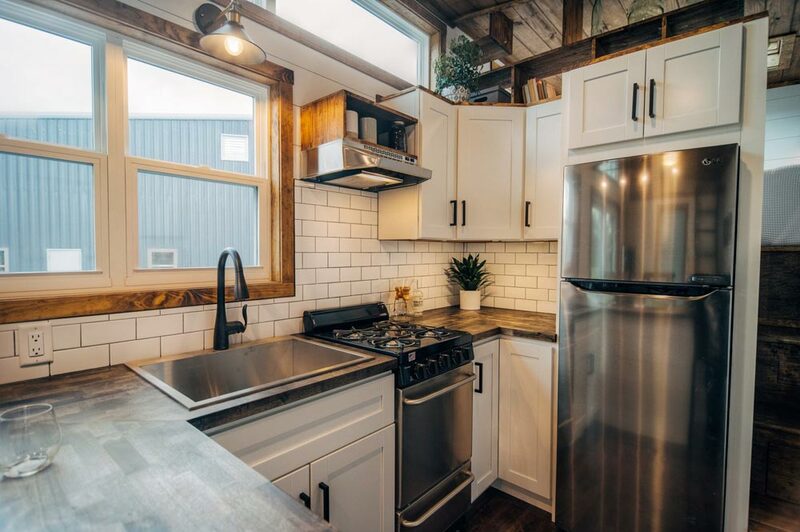 There are upper cabinets in the corner, a cabinet above the stainless steel refrigerator, a freestanding gas range with venting hood, and a large single bowl sink. 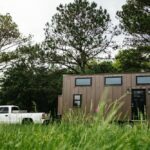 The bedroom is located over the gooseneck. 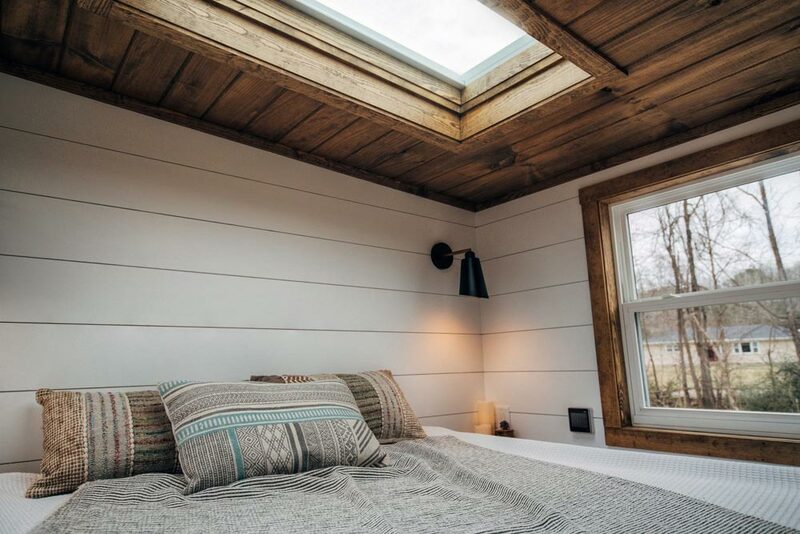 The bedroom has a custom built-in storage bed, Velux skylight with solar powered auto-darkening shade, and open shelving above the partial privacy wall. 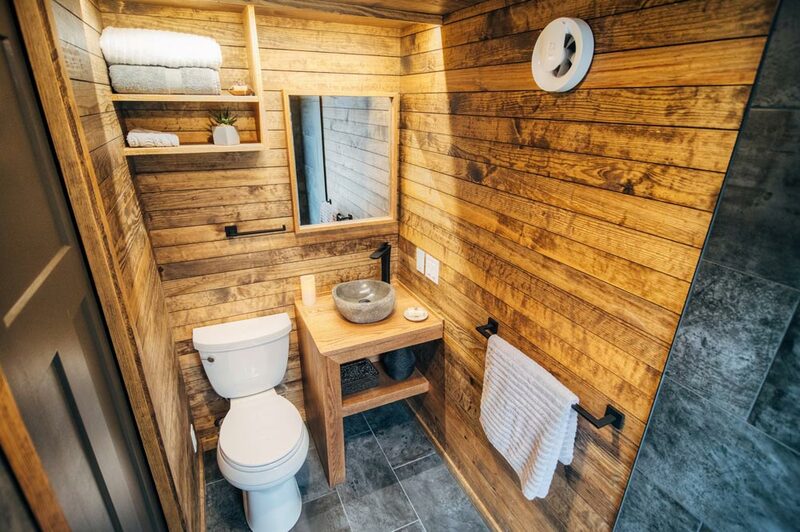 The gorgeous bathroom provides an excellent view from the custom tile shower. 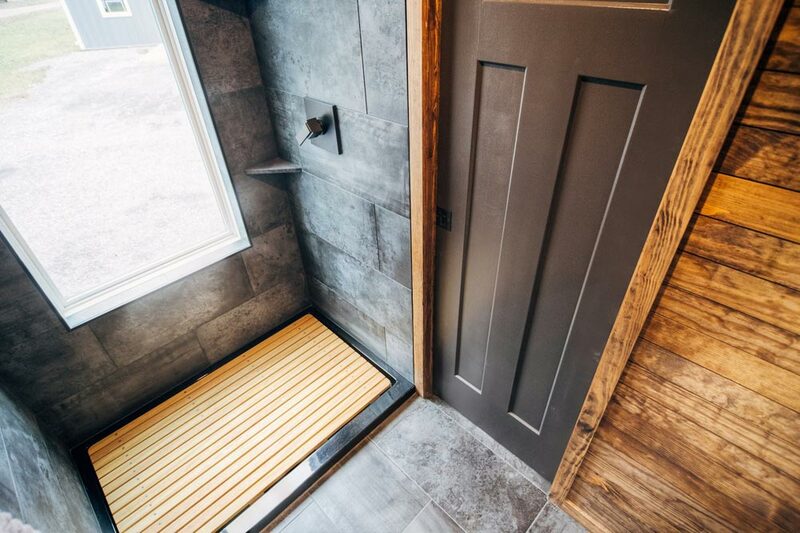 The shower has a black shower pan and wood shower pan insert. 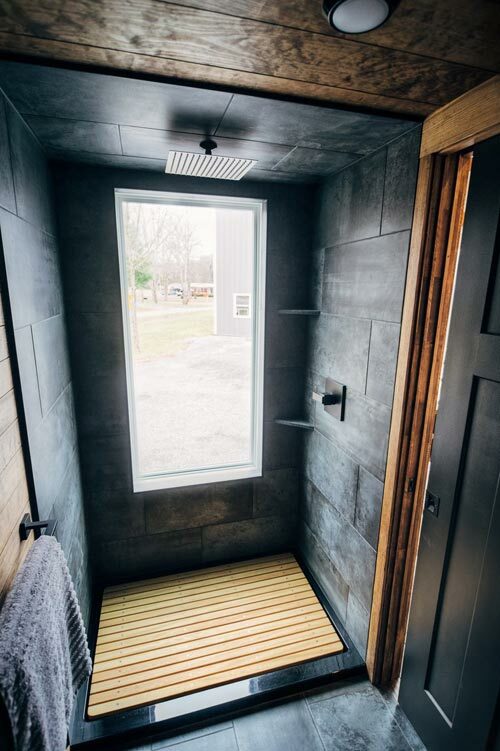 The tile shower, wood walls, and a free-standing river rock sink give the bathroom a luxurious finish. 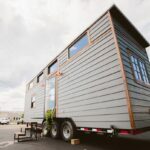 For more information about the Lupine, please contact Wind River Tiny Homes. 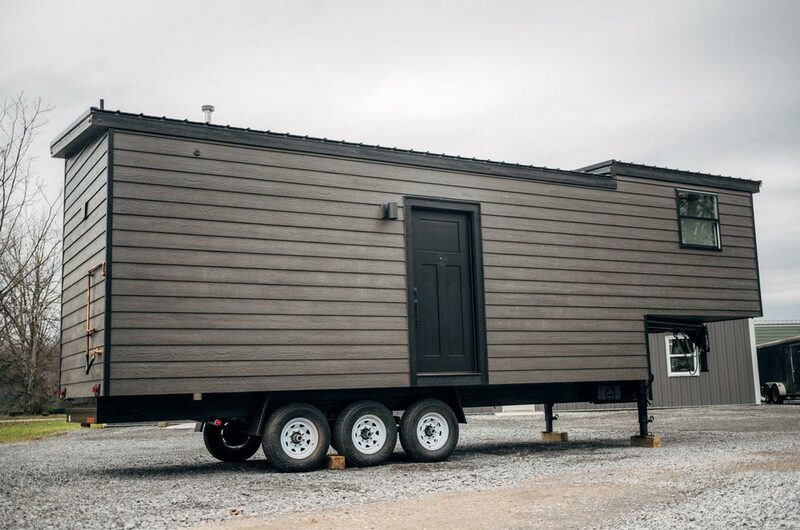 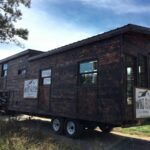 Also available from Wind River Tiny Homes: Noah, Silhouette, Acadia, Ironclad, Monocle, Phoenix, Nomad's Nest, Wind River Bungalow, Triton, Mayflower, Rook, Chimera.